Last weekend I attended my first THATcamp at San Diego State University. If you have not been to a THATcamp before, imagine a free-form, partly spontaneous and hugely well-organized “unconference” powered by the digital humanities community. 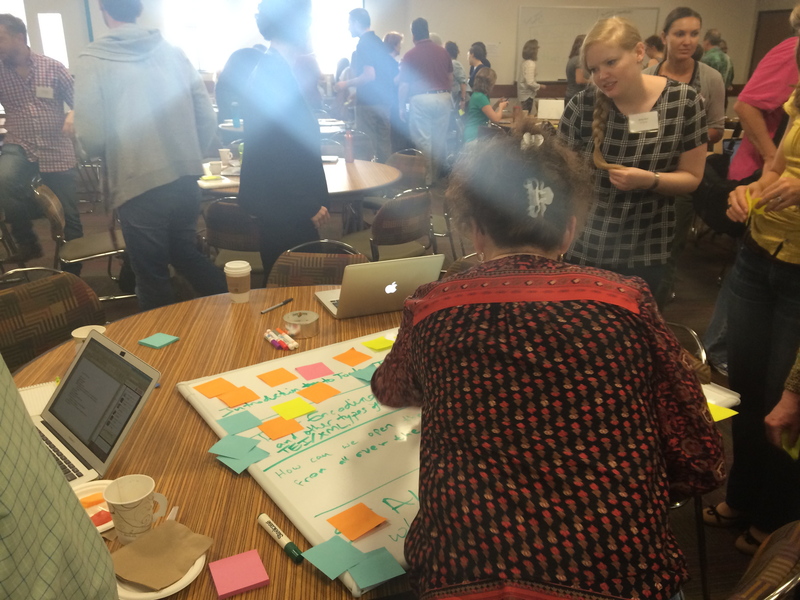 Attendees get to vote on workshop ideas with colorful post-it notes. Instead of wearing uncomfortable suits with elbow patches (the true mark of an academic according to popular media), many attendees wear jeans, checkered shirts, and comfortable shoes. People are welcoming and excited, there are bagels and coffee readily available, and perhaps best of all the conference is free to attend. There is no established hierarchy at THATcamps—there are professors, undergraduates, graduate students, librarians, and other professionals in attendance, and all are encouraged to lead and participate in the workshops. Even people who are in the digital humanities community who cannot attend the unconference are welcome to join the conversation on Twitter. 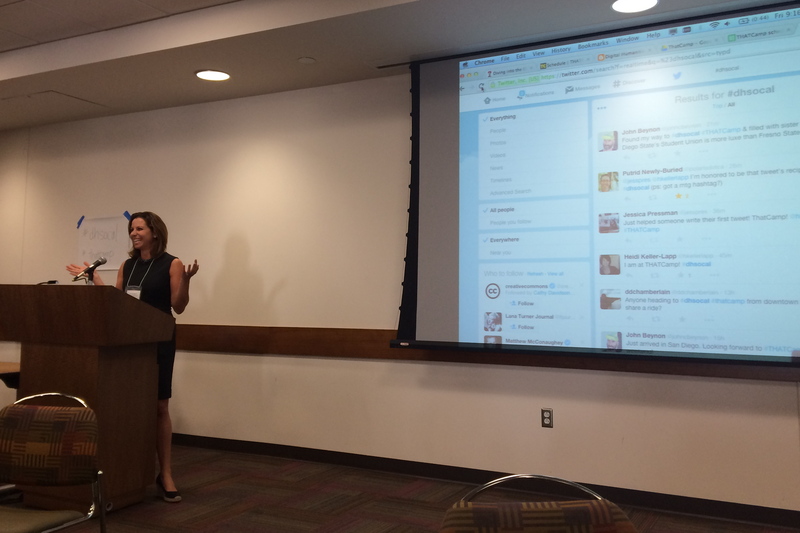 The hashtag for this past weekend’s THATcamp was #dhsocal. A selection of tweets from the event are captured in John Beynon’s Storify piece. To unwind after the conference, everyone is welcome to a “hi-tech happy hour” where attendees can talk about the day’s events. The first workshop I attended was Tara Zepel’s Visualization Workshop where we talked about visualization as a process, how visualizations are affective, and how to gather data. Zepel wrote a hugely helpful Google doc on visualizations too. She opened the session by pointing us to a visualization on U.S. gun deaths in the years 2010 and 2013. The visualization impressively documents each victim’s age, race, gender, and often how he or she was killed. We discussed how this visualization affectively impacts the viewer. Created just after the Sandy Hook Elementary School shooting, the visualization depicts how frequently young children die from gun violence. 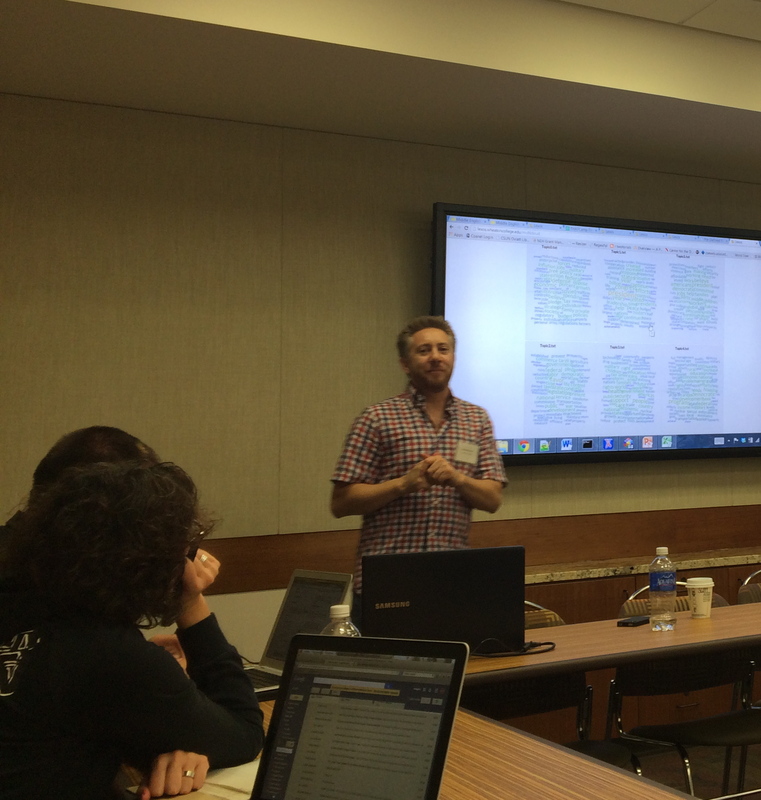 The workshop considered the merits of the work and how we might imagine editing the visualization. I can only imagine how useful it would be to have included different colored lines to visualize how gun violence impacts different racial groups and communities. All the data is so carefully documented. 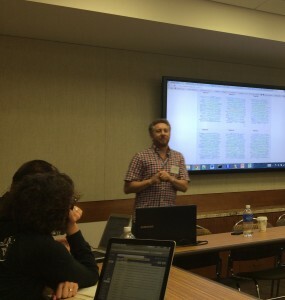 Scott Kleinman’s workshop on Topic Modeling was practical and helpful as well. Kleinman is an animated, interesting teacher. We learned how to make visually appealing topic models through Lexos, a tool developed at Wheaton College, and we thought about the results of topic modeling multiple texts. While, currently, creating topic models and word frequency analysis is relatively easy with one text, doing this work with multiple texts is much harder. Lexos makes this process much easier. Lexos can compare the styles of multiple texts and tell you which texts are most stylistically similar to each other. This could be an incredible tool for studying the style of anonymous authors, analyzing the complexities of genre, and many other projects. Posner also lead the keynote for Friday’s session. She showed us incredible projects her students created in her digital humanities classes. Renee Romero, one of Posner’s undergraduate students, shared her incredible collaborative project on Google Glass that analyzed the power and limitations of the technology. One attendee asked about the number of women and men in Posner’s classes. Posner said there were perhaps more women in her classes. One person in the audience enthusiastically said, “girls rule the DH world.” Sometimes Posner’s female students do not exude confidence, so she asks them to repeat after her: “I have expertise in interface design. I have expertise in coding. I have expertise in…” Digital humanities can change the environment of “tech-culture” to include women. Joanna Brooks, the chair of the Department of English and Comparative Literature at San Diego State University. 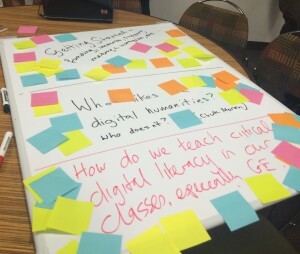 also talked to the group of Friday attendees about doing a critical digital humanities. She said, “DH is as DH does,” which everyone wanted on a t-shirt, and meant that the critical work we do as digital humanists provides the momentum in the field. While I missed some excellent sessions on Saturday, including Jeremy Douglass’s and Mark Marino’s “Tools Workshop: ACLS Scalar Workbench” and Elizabeth Losh’s talk on FemTechNet, I left THATcamp feeling not only that I knew more about digital tools and digital humanities more broadly, but I felt empowered to do more digital humanities work with my own students. Posner encouraged us to ask real questions of students, questions that you do not know the answer to. Tara Zepel said that we should not let difficulty with technology stop us from pursuing ideas that need visualization. So I left the conference with these gems in my head and the desire to take greater risks in the questions I ask and the technical skills I pursue. Congratulations to Jessica Pressman, and the entire organizing team, for organizing this amazing event!